Kovalam Beach - This beach has been the favourite joint for tourists since the1930s. 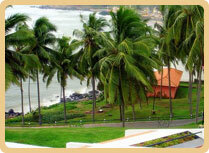 Kovalam consists if three beaches and offers great accommodations and resorts. Poovar Beach - It is the most unspoilt beaches enveloped by serene backwaters. It lies very close to Vizhinjam, a natural harbour. It is believed that the trading ships of King Solomon landed in a port called 'Ophir', which is figured out as Poovar. Poovar has been one of the ancient Muslim settlements along the western coast of India. Varkala Beach – It is a seaside resort and spa and is also a Hindu pilgrimage centre. The main attraction here is the 2000 year old Swami Janardana tempe. Marari Beach – It is a beach in Alleppey District of Kerala, India. Barely 11 Kilometers from Alappuzha (Alleppey) town, this sleepy little village, called Mararikullam, is an idyllic location for a vacation. Bekal Beach – It is a small place located on the shores of the Arabian Sea in the Pallikare village in Kasargod district of Kerala stateHome to the Bekal fort, built by Tipu Sultan, the most well preserved and largest fort in the state. Beypore Beach - Beypore is located about 10 kms south of Kozhikode town at the mouth of the Chaliyar River. Nearby attractions in Beypore include the fishing harbour, hardly a kilometer from the shipbuilding yard and Kadalundi Bird Sanctuary, which is about 7 kms from Beypore. Rejuvenate, refresh, revitalize - The Ancient Way Ayurveda originated in India more than 10,000 years ago and is believed to be the oldest healing science in existence, from which all other systems emerged. The word Ayurveda is derived from two words; 'Ayu' which means life and 'Veda' which means knowledge of. It is not only a natural way to refresh oneself, and eliminate all the toxic imbalances but also helps combat illness. Since, Kerala is blessed with natural forests and a cool monsoon season it is best suited for Ayurvedic treatments and is also called the 'Land of Ayurveda.' Kerala is the only state where Ayurveda is practiced with absolute dedication. Ayurveda leaves you refreshed, healthier and fresher. 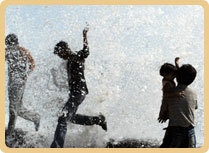 The monsoon is considered the ideal time for rejuvenation in Kerala i.e. between June and September. Backwaters are a network of lakes, canals and estuaries and deltas of forty-four rivers that drain into the Arabian sea. Backwaters is a unique feature of Kerala and is not found in any part of the world. The canals connect the villages together and are still used for local transport. The most exciting thing on the backwaters of Kerala, however, is the 'Kettuvallom' which has become the most popular tourism product in India today. The houseboats of Kerala are huge, slow-moving, exotic barges used for leisure trips, Kettuvallams (in the Malayalam language, Kettu means "tied with ropes", and vallam means "boat") are also considered to be a convenient mode of transport. 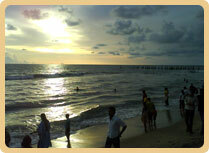 The popularity of Kettuvalloms has returned in the function as major tourist attractions. 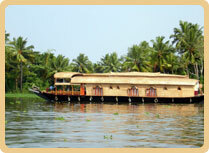 Many find the Kettuvallom an ideal means of exploring the beauty of the Kerala backwaters. Today, the houseboats have all the comforts of a good hotel including furnished bedrooms, modern toilets, cozy living rooms, a kitchen and even a balcony for angling. Parts of the curved roof of wood or plaited palm open out to provide shade and allow uninterrupted views. The largest backwater stretch in Kerala is the Vembanad Lake. Vembanad Lake is at the heart of Kerala Backwaters tourism with hundreds of kettuvallams crisscrossing it and numerous resorts nestling on its banks. Kerala has a long chain of lush, mid-clad hill stations that are home to exotic wildlife. The major Hill stations of Kerala are: Munnar, Ponmudi, Neliyampathy, Wayanad, Pythal Mala, Ezhimala, Devikulama and Wagamon. Munnar Hills - Sprawling tea plantations, picture-book towns, winding lanes and holiday facilities make this a popular resort town. It is situated in the confluence of three mountain streams - Mudrapuzha, Nallathanni & Kundala. Ponmudi - This one of a kind hill station is located in Thiruvananthapuram district of Kerala, at an altitude of around 610 metres. It is also home to the highest peak in the state and also the Meenmutty Falls. Known for its rivulets, rapids and rich forest fauna, ponmudi enthralls any visitor. Ramakalmedu - Rolling green hills and the fresh mountain air make Ramakalmedu and enchanting retreat. The hilltop also offers a panoramic view of the picturesque villages of Bodi and Cumbum on the eastern slope of the Western Ghats. Vagamon- One of the most beautiful places located at the border of Idukki - Kottayam with a chain of three hills - the Thangal hill, the Murugan hill and the Kurisumala, important for Muslims, Hindus and Christians respectively. There are many fine resorts available in the surrounding areas with affordable cost for trekkers. 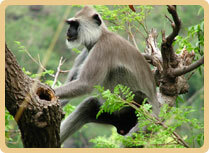 Nestled in the lush forests of the Western Ghats in Kerala are 12 Wildlife sanctuaries and two National Parks. Some of the National Parks in Kerala are Peppara, Neyyar, Shenduruni, Periyar, Idduki, Chinnar and Parambikulam Wildlife sanctuary. The main animals in these sanctuaries are Elephants, gaur, sambar, deer, wild dogs, jungle cats, tigers, wild boars, sloth bears, leopards, lion tailed macaques, Nilgiri Tahrs, langur, malabar giant squirrel, flying squirrel, tiger,panthers, spotted deer, grizzled giant squirrels, Hanuman langurs, etc. Some of the birds seen in the sanctuaries are Water fowl, Cuckoo, Owl, Egret, Heron, Water duck, Migratory Siberian Duck, Jungle fowls, Mynas, Laughing thrushes, Black bulbuls, Peafowls, Woodpeckers, Kingfishers, The hornbill, Stork, Raptor, Darter, Cormorant etc. Kerala is also home to the last few remaining virgin forests - The Silent Valley. With global warming and other destructive elements destroying our environment day in and day out, these virgin forests are a testimony to the purity that Kerala has kept over the years. Some of the must see sanctuaries in and around Kerala are: Periyar Tiger Reserve - Set high in the Western Ghats, it is a Project Tiger nature reserve and one of the most picturesque locations idling in the middle of the Cardamom Hills. Also known by the name of Thekkady, this place is know for it's austere serenity, calm and quiet. Aralam Wildlife Sanctuary - Covered with tropical and semi evergreen forests, the Aralam Sanctuary is home to a vast variety of flora and fauna endemic to the Western Ghats. Herds of deer, elephant, boar and bison are common sights. Leopards, jungle cats and various types of squirrels are also seen here. This is one of the main production centres of hybrid coconut seeds in the country. Muthanga Wildlife Sanctuary - An ideal destination to watch herds of wild elephants, the Muthanga Wildlife Sanctuary is contiguous with the protected area network of the Nagarhole National Park and the Bandipur Tiger Reserve in the neighbouring State of Karnataka and Mudumalai of Tamilnadu. This sanctuary spread over 345 sq km is rich with fauna and flora, and comes under Project Elephant. The Kumarakom Bird Sanctuary - It is located on the east coast of the Vembanad lake. The lake is famous for its scenic beauty and has become a major tourist attraction. It is an ornothologists paradise and home to many migratory birds. Kadalundi Bird Sanctuary - Also another favorites among bird enthusiasts, the Kadalundi Bird Sanctuary is found in the town of Vallikunnu. Be at peace with nature. An upcoming tourist destination. The forests of Western ghats are punctuated with large and small waterfalls that gurgle and splash down the mountain side. The wooded forests forests of Western ghats are hidden with cascading showers. The important waterfalls in Kerala are Athirapally, Vazhachal, Palaruvi & Tusharagiri. Athirapally- It is a 800 foot high waterfalls at the entrance of the Sholayar ranges and is a famous picnic spot for backpackers. The falls are very popular with tourists. 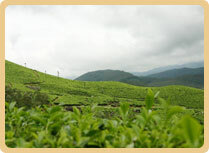 Athirappally is located 78 kms. from Kochi, located at the entrance to Sholayar ranges, this waterfall is a popular picnic spot. Vazhachal- Vazhachal is a picturesque spot just a short drive from Athirapally and is adjacent to dense green forestland. Vazhachal is part of the Chalakkudy River. Palaruvi- Here you can see ruins of ancient temples. The water is said to be medicated as it flows down from the forest and is said to be a preventive for many diseases. Thusharagiri- Meaning the snow capped mountains; Thushargiri exhibits a unique kinship between the land and water. The three waterfalls on the backdrop of the Western Ghats provide an exhilarating and spellbinding sight to the visitor. Meenmutty Falls – It is the largest and most spectacular waterfall in the Wayanad District, having a height of 300 metres, is a 2 km hike though the jungle from the main Ooty Road. 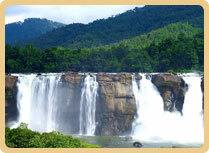 It is Kerala's second largest waterfall and the one most unspoiled in its natural setting. Soojipara – These falls are around 22 kms from Kalpetta. This is one among the many other waterfalls present in Wayanad. But Soochipara falls stands apart. A must visit place if you are in Wayanad. Known for its performing arts like Koodiyattam, Kathakali, Ottamthullal have grown in popularity as has the place. However, many of these native art forms largely play to tourists or at youth festivals, and are not as popular among ordinary Keralites. 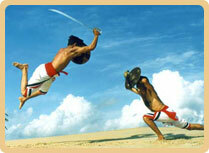 Kerala also has its own indigenous form of martial art — Kalarippayattu, derived from the words kalari ("place", "threshing floor", or "battlefield") and payattu ("exercise" or "practice"). Influenced by both Kerala’s Brahminical past and Ayurvedic medicine, kalaripayattu is attributed by oral tradition to Parasurama. After some two centuries of suppression by British colonial authorities, it is now experiencing strong comeback among Keralites while also steadily gaining worldwide attention. There are also the festivals and celebrations that Kerala is famous for. Onam, Vishu, Eid, Christmas – all are celebrated with much vigour and enthusiasm as ever. It is best to visit during one of these festivals Kerala has its own distinctive culture and traditions. Be it the mundu wearing men or the saree clad woman, everywhere you look you can find something striking. Adithi Devo Bhava, which means “Guest is God” in Sanskrit is the motto for anyone received from outside in this magnificent land. Be felt like God. The food is also very different when compared to other states. The expansive sadhya, the weet payasam, the Kozhikodan biriyani, dosa and chutney and so many other exclusive dishes – all add a distinctive flavour to the state that Kerala is. Multi cuisine food is also found with a wide range of options – ranging from Arabic to continental to Chinese to Thai and many many more. Restaurants and hotels catering to these different cuisines can be found all throughout the state. Let your taste buds revel. Kerala has one of the most enviable climatic conditions. It has tropical Climate and remains pleasant for most of the year. A few fast facts about the climate are that Kerala does not have a dry spell as is in rest of India. Average temperature can vary anywhere between 20-30 degree Celsius. But there is one time, when everything is at it’s best. When the dun has almost baked up the land, the one thing that revives everything back comes along – the monsoon breaks to and applause of the pitter and patter of the rain. Water brings life, vigour and your mornings are freshened up with glistening leaves, moist ground and pleasant weather.